Lignin is one of the most valuable and abundant renewable resources found on Earth. However, this polymer usually undergoes severe chemical modifications during isolation, and these changes restrict many of its industrial applications. Therefore, a successful isolation procedure must avoid both fragmentation and condensation reactions. One of the methods commonly used to recover lignin from wood and other lignocellulosic materials is steam explosion followed by mild-alkaline-extraction. 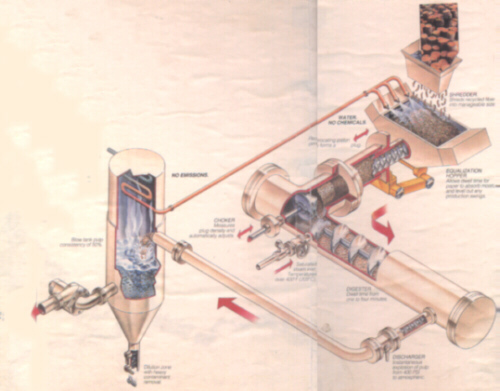 Steam Explosion technology involves treating various biomass resources. In steam explosion the biomass is pressurized with high steam pressure for a certain period of time, (typically 200 - 450 psig) for a period of 1 - 10 minutes and then explosively discharging the product to atmospheric pressure, which results in a sudden decompression. This explosive discharge changes the starting material (solid) into a fibrous mulch by a combination of mechanical and chemical action. In the case of wood chips, the explosion causes defibrillation of chips into fiber bundles, and partial hydrolysis of cellulose, other carbohydrates, lignin and volatile components. Specifically this site deals with a two cubic foot batch digester steam explosion unit and a continuous process unit located the Thomas M. Brooks Forest Products Center of Virginia Tech under the supervision of Robert S. Wright. Several images from the unit are pictured below. The batch process will be described further and is pictured here. 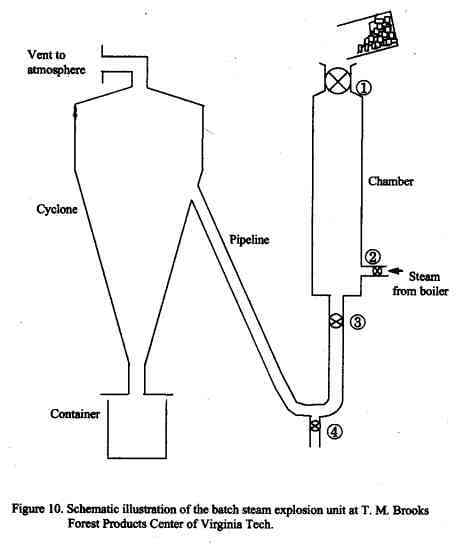 A schematic of the continuous process is pictured here. In the batch unit, before any sample is fed into the steam explosion chamber, all valves must be closed except for valve �. For each batch, the sample would be put into the chamber through valve �. After this valve is closed, steam would be released into the chamber via valve ‚. The pressure and temperature of the steam are controlled from a boiler. Time is kept constant while pressure and temperature are varied in relation to severity of steam explosion chosen. Valve ƒ is released when a desired cooking time has been reached. Simultaneously, an explosive expansion of the steam occurs and an exploded sample (called steam explosion fibers, SEF) would be collected in a container. Finally, excess steam is released through valve „. Although extensively studied and demonstrated on the pilot plant scale, steam explosion of biomass is not currently industrially practiced. However, treatment of biomass with high pressure steam, followed by sudden decompression, is industrially practiced in the “Masonite process” which represents the basis for fiberboard production. Steam explosion is unique because the technology derives from specialized equipment that can continuously inject fibrous materials into a digester pressurized at between 200 to 450 psig with high pressure steam and then explode the product out. No other equipment is able to do this.